10000 PSI POWER TEAM PA6 AIR DRIVEN HYD PUMP 9-8000. 10000 PSI AIR DRIVEN HYDRAULIC PUMP. Brand new, POWER TEAM PA6, Model F air driven hydraulic pump designed to operate single acting cylinders. Compact, lightweight and portable for powering all types of hydraulic equipment. /min at 500 PSI 29 cu. /min at 5000 PS 10 cu. Reservoir Size 105 cubic inches. Sound Level 85 dBA at 10000 PSI. Air Inlet Port 1/4 NPT. Size 9-1/2" x 5" x 7-3/4. 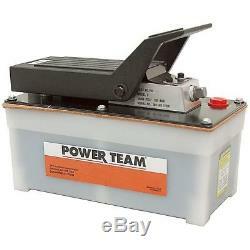 The item "10000 PSI POWER TEAM PA6 AIR DRIVEN HYD PUMP 9-8000" is in sale since Wednesday, April 9, 2014. This item is in the category "Business & Industrial\Hydraulics, Pneumatics & Pumps\Other Hydraulics & Pneumatics". The seller is "burdensales" and is located in Lincoln, Nebraska. This item can be shipped worldwide.